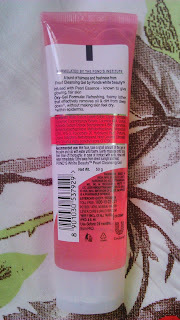 I just grabbed the product from a local store just because of the cute pink packaging. 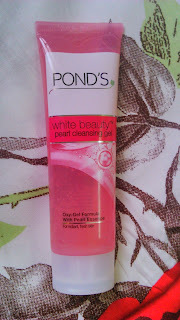 I have always been a fan of Ponds products especially the cold cream and body lotion. I am not very fond of the products that claim to give fairness as I believe true beauty is not measured by the skin colour. Enough of philosophy now, read on to know more about the product review. A burst of fairness and freshness from Pearl Cleansing Gel by Ponds white beauty. Infused with Pearl Essence known to give glowing, fair skin. Oxy-Gel Formula- Refreshing foamy lather that effectively removes oil and dirt from deep down without making the skin feel dry. Wet face and take a small amount of gel on palm and rub with water until foamy. Gently massage onto the face, then rinse off thoroughly. I have fair and oily skin. So I thought of giving the product a try as it claims not drying of the skin. I used the product in the morning. It lathers quite well and a very small quantity is enough for the whole face to use. Unlike the cute pink colour packaging, the gel is transparent in colour. After a little bit of rubbing on face, I rinsed it off. The product gets rinsed off quite easily and you don't feel like residue is left. It didn't make my skin fair but it did make it feel fresh. Also it didn't dry out the skin. As far as oil and dirt removal are concerned, the product does a decent job. And the fragrance is just Oh So Awesome!!! Makes the skin feel fresh. Water, Sodium Laureth Sulfate, Glycerin, Acrylates, Copolymer, Cocamidopropyl Betaine, Cocamide MEA, Sodium Hydroxide, Sodium Chloride, Benzophenone-4, BHT,Niacinamide, Methylchloroisothiazolinone, Methylisothiazolinone, Tetrasodium, EDTA, PPG-9, Polysorbate 20, Hydrolyzed Pearl, Perfume, Linalool, Butylphenyl Methylpropional, Hexyl Cinnamal, Citronellol, Amy Cinnamal, Alpha-Isomethyl Ionone, CI 17200. A great product if you are just looking for a cleansing gel which doesnt dry out the skin. It doesn't make the skin fair as per the claims though but am ok with it. But instead of cleansing gel I would use a cleansing milk. Have you used this product if yes tell me your experience? Do you prefer cleansing milk over cleansing gel like me?